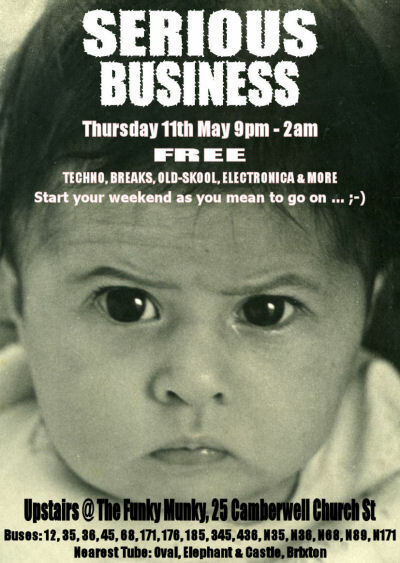 That’s me on that flyer, 4 months old, and serious! Back in 2007, when Serious Business nights were running, I thought it would be a good idea to have a go at being a DJ for one night. At around 10pm and with mostly only my friends in the room upstairs at Archway 269 I set out to ‘try everything once’ just this once. I really didn’t enjoy it much. I was CD mixing and at one point it just stopped working and I had no idea what to do. I think I actually screamed… A friend (Roz) had to come to the rescue but that brought home to me this really wasn’t my thing. I never felt a burning desire to do it again and that was that. Anyway, here’s pretty much the best of the repertoire of CDs I had at my disposal. I put them all together and uploaded them to Mixcloud last year, before the trip to Brazil. I was listening to it again today and decided to blog it for posterity. This was ‘mixed’ on Adobe Premiere. I used mainly to overlay the tracks so there would be no gaps between them, then exported the audio only. Surprisingly effective. Also I couldn’t help but go through all the PRoD/Offline photos in that collection… We had some amazingly silly and fun times back then!!! !